The third paragraph of the resolution would have been crystal clear (and quite pointed) to those assembled in the Physics Amphitheater that noon but I realize that it likely appears completely opaque to a reader to day. I’ll try to explain it tomorrow. Bonus: They’re relocating a playing field. 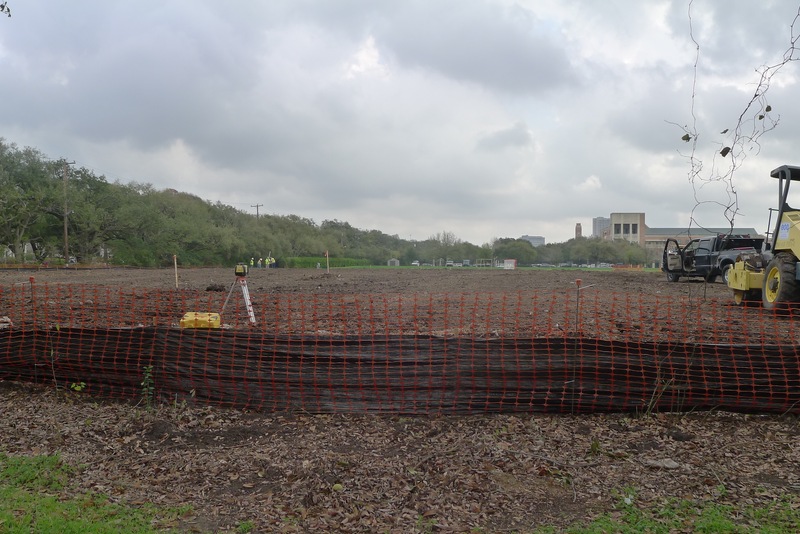 The former prairie cleared completely? Yes. Rode by there Sunday and it was scraped flat and slightly raised (presumably for drainage). On the latter, I’d understood that early on Lovett wanted Rice to have a Yale-like residential college system. But, of course, that living arrangement wasn’t actually established until 1956. Were the early dorms — East Hall et al — routinely called “residential colleges”, as seems to be the case in this statement? 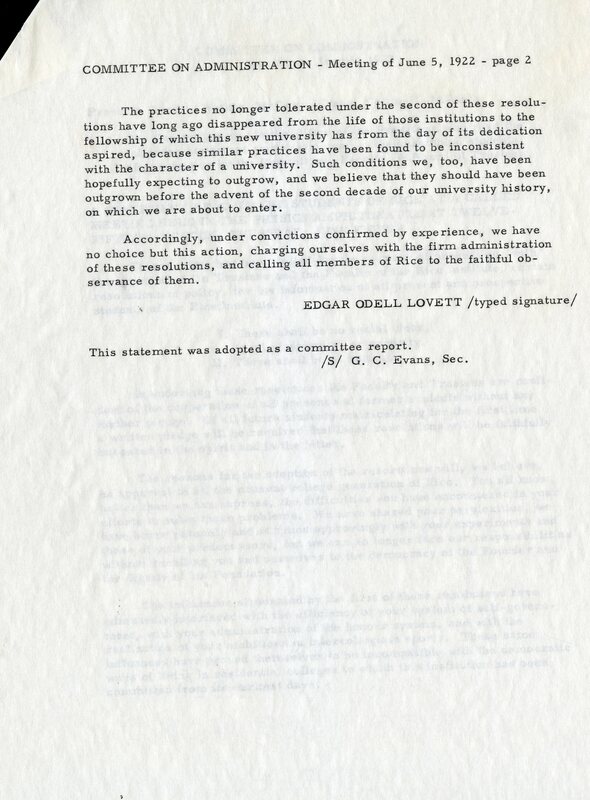 What were the reasons that it took so long for Lovett’s residential college system to be realized? Not sure what the Rice Administration was afraid of in barring social clubs, fraternities, and sororities from the Rice campus in 1922…unless it was students having a little fun and a life outside of academia. By 1922, plenty of American colleges including the Ivy League schools, Duke, Vanderbilt, Northwestern, et al had thriving Greek systems that added to collegiate life. Didn’t appear to threaten their educational mission. 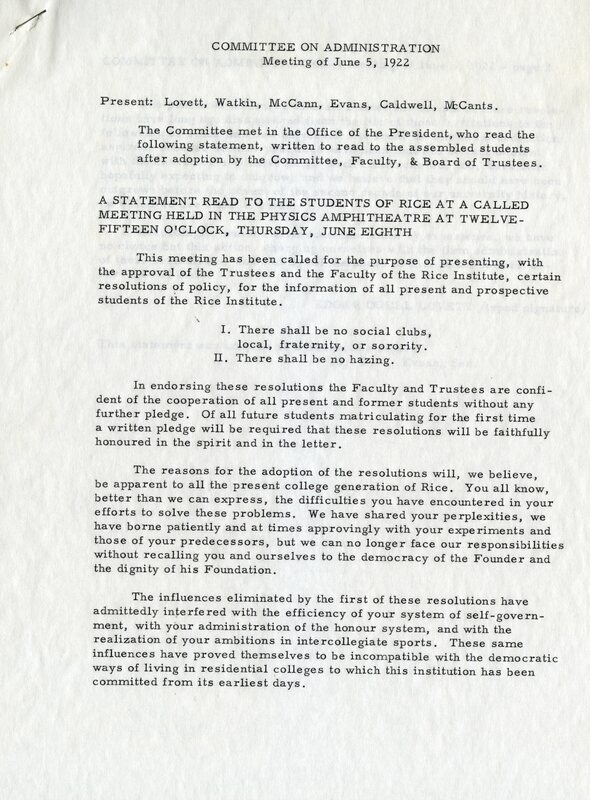 What were the Rice trustees and faculty thinking? I am going to guess it had to do with drinking, since this was prohibition? How did the literary societies get by this ban? Obviously “social clubs” meant something else! I think in this sense “residential colleges” means “institutions of higher learning that have dorms.” My understanding of Rice history was that many of the early leaders, and especially President Lovett, had a strong antipathy to the wild behavior and hazing of many fraternities at other colleges. That, plus a generally less edgy raison d’être, is probably why the “literary societies” thrived. 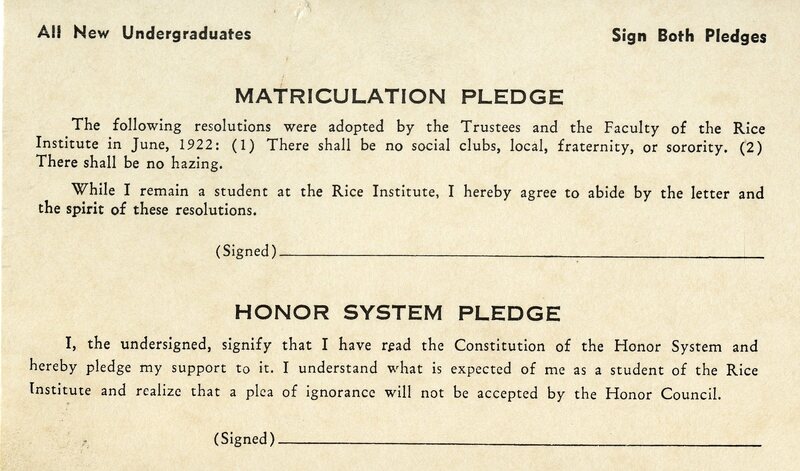 “The following resolutions were adopted by the Trustees and the Faculty of the Rice Institute in June 1922: (1) there shall be no social clubs, local, fraternity, or sorority. (2) there shall be no hazing. I wonder how well they enforced the hazing rule. My first semester at Rice, the fall of 1973, I recall seeing some hazing of the incoming members of the football team. The pit where the greased pole once stood still existed in ’73, between The MOB’s practice field and the gym. Was that activity not hazing? Dragging dead fish around? Wearing freshling beanies? They had rather rather more success with the social club ban than with the hazing ban. There were some very bad incidents for a very long time.